1Toast walnuts in a skillet over medium heat; cook and stir until browned and fragrant, 8 to 10 minutes. Remove from skillet. 2Fill a pot with lightly salted water and bring to a rolling boil; stir in ravioli and return to a boil. Cook uncovered, stirring occasionally, until the ravioli float to the top and the filling is hot, 3 to 5 minutes. Drain. 3Warm butter in a skillet over medium heat until slightly brown, about 1 minute. Add balsamic vinegar; cook and stir until melted and combined, 1 to 2 minutes. Stir in ravioli; mix until combined. 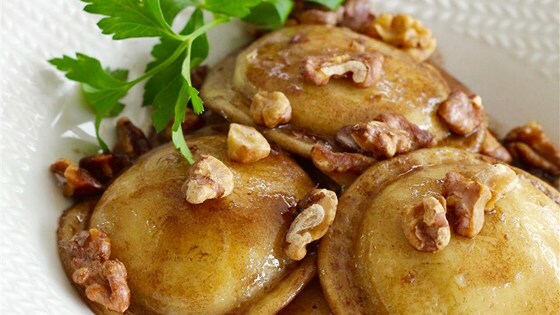 Top with walnuts and Parmesan cheese. The store-bought ravioli can have any desired filling.